A recent You Gov poll found that Americans have a very high opinion of many things both cute and cuddly, as well as cornerstones of American culture. Its not that surprising that the two top things in this poll are food, especially ice cream and apple pie. Kittens are also no surprise. I think people like the idea more than the reality, but that could just be my allergies talking. But one thing that I found really surprising is, with the exception of ice cream, Americans approve of background checks on gun purchases more than anything else. 92% of Americans approve of background checks according to a Quinnipiac poll released in February. Ice cream edged out background checks by only 1%. Kittens were blown away by background checks by nearly 16 points. Kittens, needless to say, while cute and cuddly, are pissed. 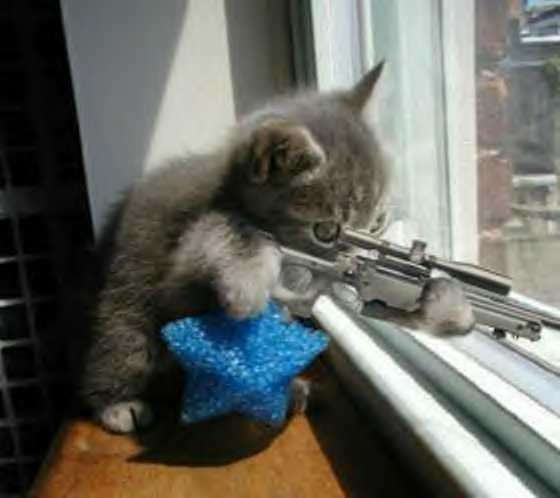 Harnessing their inner sense of vengeance, something all felines possess, kittens have taken to a program of firearms training to strike back at the items that outperformed them. Beware Good Humor man. Watch out Apple pie. Stand back, background checks. Kittens are coming to get you. vibinc » Blog Archive » Kittens lash out at ice cream, apple pie, and background checks http://t.co/Vh9CJ0IHwn via @vibinc haha!! !